It's amazing. We are into October and the inner basin refuses to seriously freeze anywhere. The only growth is occurring in the Greenland Sea and the Beaufort export terminals. The only real freezing is occurring in the sheltered CAA. Hopefully this will soon be over, but it's still disturbing. We're dealing with a complex system in the Arctic. Attempts to oversimplify the complexity lead to misunderstandings. My tendency to discount what a person says here is inversely proportional to the certainty by which they make their declarations. I wonder whether this little (remains of multi year?) ice floe N of Alaska in the W Beaufort Sea will survive until re-freeze starts in that area?!? The chukchi sea refreeze looks set to be terrible. the sst is between 5-10 C, and is the warmth likely has some depth to it. as for the bering refreeze....what refreeze? it will probably be super limited, almost inconsequential. with el nino conditions coming on, record GHG concentrations, record ocean temps...2019 seems set up for a serious catastrophic melt. Then 2020 will see the effects and the world collectively say...OOPS. Don't know if present 10degC over average High Arctic temps guarantee low ice for the coming cold season. But, this present leap from average High Arctic temps seems strongly connected to the surge of High Arctic temperatures that began 2 years ago & maybe 3 years ago, during times of no or little direct solar energy in the Arctic. Two years ago, near our present date, High Arctic temperatures spiked to about 8+ to 9 degC over average but appeared they would settle down towards about 4degC over average. But a set of quickly fluctuating temperatures as high as 9degC over average occurred, until a final record busting spike of 19-20degC over average shocked the Arctic. All this jumpiness & record breaking occurred in ~ 50 days. The next 40-50 days could prove very interesting. Now, High Arctic temperatures, during times of no or little direct solar energy, have been rising steadily above average in the High Arctic for 60 years, double the rate of temp climb of the Earth average. But, this two (or 3) year leap, during times of no direct solar energy is crushing the past High Arctic doubling rate for those 60 years. & all this is occurring, during the time that the sun has had a 12 year low radiation level. Squeezed in a blog post on this before the PIOMAS numbers get updated: Freezing season has started, or has it? no offense meant but my first thought was something like, if there were no global warming the ice would keep it's typical volume and extent. of course you are literally right but then this IF > THEN is not the case hence the reasoning sounds kind of obsolete even though true. tell me where i got it wrong if so, i'm listening, just sharing my initial thought while reading your post. I don't get it. Atlantification is stronger than ever (more open water on the ATL front up North), yet SST was much higher in 2016 and 2017 on the Atlantic side than in 2018. Currently we do not even have very strong positive SST anomalies in the N ATL and yet we have more open water than ever. How come??? We had no Fram transport all summer long, but it's making up for it now. Careful analysis of Mercator ocean cross sections and animations led me to conclude that warm salty water wrapped into the coastal area near the tip of Greenland, then was cooled by intense storms and cold air, last winter and early spring. Oceanic deep convection was intense after the major stratospheric warming drove cold air towards the Labrador sea and the far north Atlantic. Summer and early fall cool SST anomalies south of Greenland are indicative of a shallow warm fresh layer that has been disturbed by storms. And amplified flow of cool water from the CAA through the Labrador sea into the north Atlantic. Cold SST anomalies in the late winter and early spring are indicative of weak deep convection, not summer temperatures. Apparently a major reason that warm Atlantic water was moving into the Arctic from 2005 through 2012 was a weak overturning circulation. Instead of heading for the Greenland and Labrador seas, warm salty water headed up the coast of Norway for the Arctic ocean. There's a recent report that deep convection in the Greenland sea has increased as ice has decreased on the continental shelf edge. Salty water is now able to penetrate the shelf then cool and sink. There are probably other reasons that the Atlantic side of the Arctic ocean is apparently cooler than it was a few years ago. One may be that it's actually warmer at depth in parts of the Barents sea region. Stormy weather directs more water to the right of the Fram strait towards Murmansk and the Barents sea. Stormy weather prevents warm surface layers from building up, but the subsurface is warmed by mixing. There's a lot going on. I await reports from professional oceanographers to make sense of it all. There was quite a bit of compaction over the past couple of weeks. The low SST anomalies would suggest a rapid refreeze could be possible but the resurgent Fram export may inhibit the formation of ice north of Svalbard. Why would a weaker AMOC lead to more transport up Norway instead of Labrador? Isn't there a 963mb GAC tomorrow?? I see no reason to see slow extent gain changing to average increases for the next week or so. Tho 2018 year's September Arctic sea ice extent low did not reach as low as the "2010's" September yearly average extent low, the very slow 2018 daily extent increase had tied the "2010's" daily extent, with over a week left in September. The still slowly increasing 2018 daily extent into October, is now a full one third of a million square kilometers less than the average extent of the "2010's". 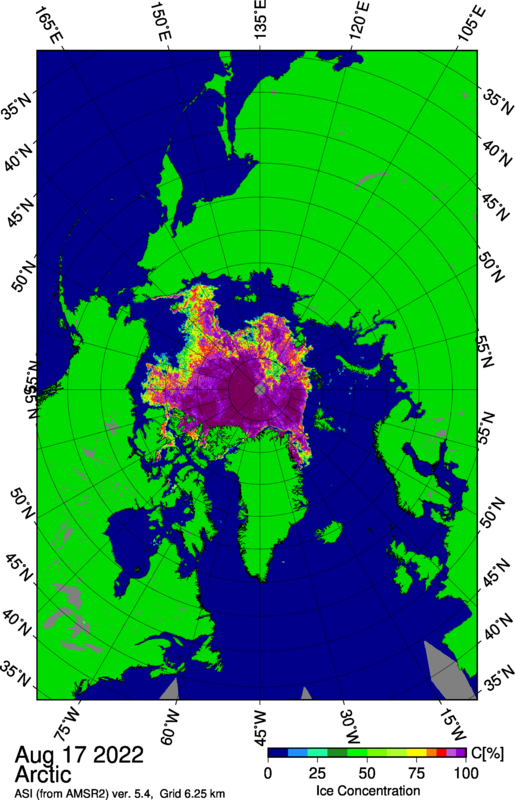 With present High Arctic temperatures averaging 10degC over the historical satellite average, Arctic sea ice increases continue lethargically, the gap to the present "2010's Arctic sea ice" average widening again to 440,000 square kilometers LESS. Ice in the heat heat heat is hard to harden. fairer perhaps to call it a lac .. a little Arctic cyclone .. or by duration , a sac .. short Arctic cyclone . b.c. So all else equal a stronger OC in the Sub-Polar Gyre (S tip of Greenland) pulls more of the ex-gulf stream water in the Iceland/Faroe Islands region towards Iceland and spiraling into the SPG, instead of towards the Faroe Islands and up the Norwegian coast. Stronger OC in the area around Jan Mayen pulls more warm(ish) water into that gyre instead of into the West Spitzbergen Current and the Barents Sea. Conversely, a weaker AMOC in both gyres allows more ex-gulf stream water into the Arctic and Barents. Basically that ~500m deep ridge from Scotland to Iceland, and SW along the MAR, is a perfect switch that responds to small changes in water density in the deep water regions surrounding it. In deeper water, currents are perpendicular to SSH gradients like wind following isobars, but in shallow water currents can just go from high SSH to low SSH. let's say you put a glass of water with ice cubes on a table in summer and wait, even though temps in summer are very high, the water will be around 0C in that glass for a long time. what i want to say is that a lot of ice is missing on the atlantic side and that without significant export in summer, that means that a big part of that missing ice has melted and of course the waters in that region suffer from the melt, consider the north atlantic ice-cooled so to say. after all winds and currents see to a certain distribution IMO and yes it's only a fraction of the entire system and all it's feedbacks but something along this line would make sense. The pack is still very mobile. Export of thicker ice continues into the CAA. Export accelerates into the Fram Strait. Returning after long travels and checking in again here I was struck by two things. First, the ice minimum in September corresponded with what most experts and cooler heads on this forum thought it would be. We waste a lot of time during the summer rebutting wild predictions that are poorly supported by evidence. Second, the current state of the ice is jaw-dropping to me, and shows the inherent complexity and unpredictability (especially on the time scale of months) of the Arctic ice system. 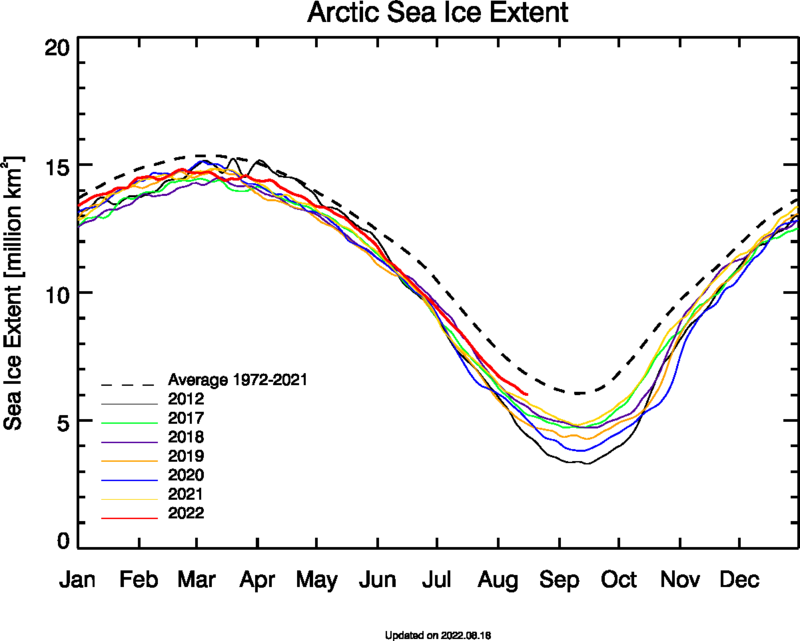 Many important things can happen to the ice, and concentrating so much on the September minimum seems to me to be an overly limited focus. Uniquorn, thank you for your superb animations and summary, as always. What is most striking to me from your first animation is how the CAB ice is continuing to hold its minimum borders. This seems to be partly because there is so much ice being squeezed out of the Fram (as you and others have commented). That exported ice is doomed to melt next summer, so it looks like little ice so far has formed in the CAB to replenish the stocks of multi-year ice in the CAB. So the (relatively small) increases in overall area or extent at present tend to mask the seriousness of the situation for the long-term condition of the CAB. Just passing on general thoughts here -- if they are obvious to you, or already discussed, then please accept my apologies. My understanding of the weak overturning leading to increased flow of Atlantic water into the Barents sea and Arctic ocean was improved by reading a real climate post by Stephan Rahmsdorf. It cleared up much of my confusion on the topic. He refers to recent papers in the scientific literature about what has been happening in the far north Atlantic. Is the ice in Fram Strait right now old ice or newly frozen ice? It wasn't clear to me reading that that they were measuring a slowdown rather than a movement (change of place). It seemed to me that the only real data demonstrated that there was less water flowing in a particular region. It also seems to me that we over the last few years have noticed considerable changes in the extreme North-East Atlantic. Is the AMOC actually slowing down, or is it just changing location? Well, it depends on the definition of the of the AMOC whether it's changing locations or slowing down. That's one reason that making sense of the literature is so difficult. There are multiple measures and definitions of the AMOC used by different authors. I have been trying to find the specific paper that discusses the increase in the Arctic inflow that may have taken place in response to reduced Labrador sea deep water formation, but I have lost track of it. However, I have found another interesting paper based on detailed measurements that convection has increased in the Greenland sea over the past 2 decades. This shift in where convection is taking place will affect sea surface height gradients and the strength of the current flowing northwards along the Norwegian continental shelf margin. As noted upthread, 963hPa cyclone today, dragging warm air across open water north of SZ. Today's ecmwf waves from windy. another record breaking day for the dmi 80'N+ .. again some 10'C above normal . This was the 13th consecutive record breaking day .. probably a record record ? The Arctic as a whole continues to warm but over the next few days it will cool down a little N of 80'+ . The transfer from melting to freezing season will continue to be slow .. b.c. Polarview, middle of the ESS arm, yesterday. These images are based on an updated soon-to-be-released version of the current sea ice age product and a near-real-time version for 2018. The scary part is that the older ice has just lifted off the CAA and been set adrift in the CAB. U. Hamburg has stopped updating their daily false colour ice concentration maps, so I have been unable to make and post the gifs showing changes through the week. Presuming the satellite coverage is not good enough to make them now, moving into the dark season. Currently 59 mb of MSLP difference Across the Arctic Basin, with a 968 storm towards the Atlantic side and 1027 mb on the Pacific side. So it will be quite windy at the moment. "U. Hamburg has stopped updating" Bremen? Presuming the satellite coverage is not good enough to make them now, moving into the dark season. They're based on passive microwave radiometry, right? So not actually affected by dark vs light. Right! And the Bremen concentration maps seem to be available now. Decision time. Either the CAB starts refreezing, or it's going into unknown territory. ....the gap to the present "2010's Arctic sea ice" average widening again to 440,000 square kilometers LESS. Ice in the heat heat heat is hard to harden. With High Arctic days of 10degC over-average temperatures, the ho hum yearly September low 2018 sea ice has rapidly switched places with other years of lower sea ice including 2007. 2018 Arctic sea ice is 550,000 square kilometers LESS than the to-date "2010's sea ice average". 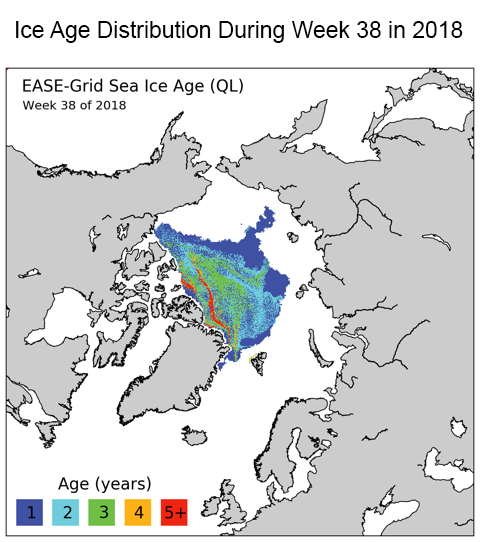 2018 now has more to-date sea ice than ONLY the year 2012, which had a spectacular loss of sea ice, much going away due to fortuitous winds that drove ices into the North Atlantic. I say ' Unknown territory' it is then Oren .. records continue to tumble up north ..
gfs tonight has gone red again as our long-lived Leslie makes her contribution to Arctic heat and moisture .. and finds herself back in the same spot at the end of the run ready to do it all again !.. Leslie may yet become the longest lived cyclone in Atlantic history . The run of record low dmi 80 figures and the record run of low extent growth figures may both extend from the present14 days to 21 .. and 2018 will really be 'out on her own ' by any and every measure . meanwhile 150,000 km2 of our precious apparent growth since minimum is actually good ice gone down the plug hole that is the Greenland sea . Plenty more looks set to join it . all these may's .. and it's only October .. b.c. And temp north of the 80th doesn't look is going to nose dive, yet.